The following excerpt from the visions of Blessed Anne Catherine Emmerich in the book The Dolorous Passion of Our Lord Jesus Christ. The following account is private revelation that was given to the German Augustinian nun during the early part of hte 19th century. When Jesus, after uttering a loud cry, expired, I saw his heavenly soul under the form of a bright meteor pierce the earth at the foot of the Cross, accompanied by the angel Gabriel and many other angels. His Divine nature continued united to his soul as well as to his body, which still remained hanging upon the Cross, but I cannot explain how this was, although I saw it plainly in my own mind. The place into which the soul of Jesus entered was divided into three parts, which appeared to me like three worlds; and I felt that they were round, and that each division was separated from the other by a hemisphere. I beheld a bright and beautiful space opposite to Limbo; it was enameled with flowers, delicious breezes wafted through it; and many souls were placed there before being admitted into Heaven after their deliverance from Purgatory. Limbo, the place where the souls were waiting for the Redemption, was divided into different compartments, and encompassed by a thick foggy atmosphere. Our Lord appeared radiant with light and surrounded by angels, who conducted him triumphantly between two of these compartments; the one on the left containing the patriarchs who lived before the time of Abraham, and that on the right those who lived between the days of Abraham and St. John Baptist. These souls did not at first recognize Jesus, but were filled nevertheless with sensations of joy and hope. There was not a spot in those narrow confines which did not, as it were, dilate with feelings of happiness. The passage of Jesus might be compared to the wafting of a breath of air, to a sudden flash of light, or to a shower of vivifying dew, but it was swift as a whirlwind. After passing through the two compartments, he reached a dark spot in which Adam and Eve were standing; he spoke to them, they prostrated themselves and adored him in a perfect ecstasy of joy, and they immediately joined the band of angels, and accompanied our Lord to the compartment on the left, which contained the patriarchs who lived before Abraham. This compartment was a species of Purgatory, and a few evil spirits were wandering about among the souls and endeavoring to fill them with anxiety and alarm. The entrance through a species of door was closed, but the angels rapped, and I thought I hear them say, ‘Open these doors.’ When Jesus entered in triumph the demons dispersed, crying out at the same time, ‘What is there between thee and us? What art though come to do here? Wilt though crucify us likewise?’ The angels hunted them away, having first chained them. 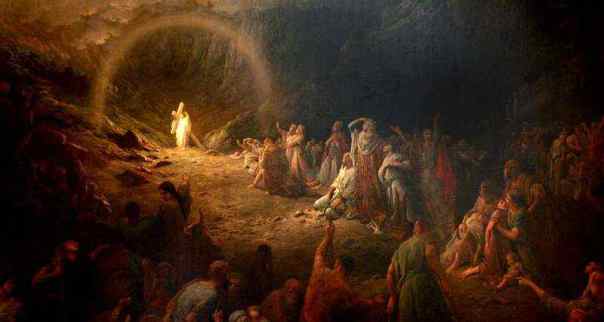 The poor souls confined in this place had only a slight presentiment and vague idea of the presence of Jesus; but the moment he told them that it was he himself, they burst out into acclamations of joy, and welcomed him with hymns of rapture and delight. The soul of our Lord then wended its way to the right, towards that part which really constituted Limbo; and these he met the soul of the good thief which angels were carrying to Abraham’s bosom, as also that of the bad thief being dragged by demons into Hell. Our Lord addressed a few words to both, and then entered Abraham’s bosom, accompanied by numerous angels and holy souls, and also by those demons who had been chained and expelled from the compartment. This locality appeared to me more elevated than the surrounding parts; and I can only describe my sensation on entering it, by comparing them to those of a person coming suddenly into the interior of a church, after having been for some time in the burial vaults. The demons, who were strongly chained, were extremely loath to enter, and resisted to the utmost of their power, but the angels compelled them to go forward. All the just who had lived before the time of Christ were assembled there; the patriarchs, Moses, the judges, and the kings on the left-hand side; and on the right side, the prophets, and the ancestors of our Lord, as also his near relations, such as Joachim, Anna, Joseph, Zacharias, Elizabeth, and John. There were no demons in this place, and the only discomfort that had been felt by those placed there was a longing desire for the accomplishment of the promise; and when our Lord entered they saluted Him with joyful hymns of gratitude and thanksgiving for its fulfillment, they prostrated and adored him, and the evil spirits who had been dragged into Abraham’s bosom when our Lord entered were compelled to confess with shame that they were vanquished. Many of these holy souls were ordered by our Lord to return to earth, re-enter their own bodies, and this render a solemn and impressive testimony to the truth. It was at this moment that so many dead persons left their tombs in Jerusalem; I regarded them less in the light of dead persons risen again than as corpses put in motion by a divine power, and which, after having fulfilled the mission entrusted to them, were laid aside in the same manner as the insignia of office are taken off by a clerk when he has executed the orders of his superiors. I next say our Lord, with his triumphant procession, enter into a species of Purgatory which was filled with those good pagans who, having had a faint glimmering of the truth, had longed for its fulfillment: this Purgatory was a very deep, and contained a few demons, as also some of the idols of the pagans. I saw the demons compelled to confess the deception they had practiced with regard to these idols, and the souls of the poor pagans cast themselves at the feet of Jesus, and adored him with inexpressible joy: here, likewise, the demons were bound with chains and dragged away. I saw our Saviour perform many other action; but I suffered so intensely at the same time, that I cannot recount them as I should have wished. Finally, I beheld him approach to the center of the great abyss, that is to say, to Hell itself; and the expression of his countenance was most severe. 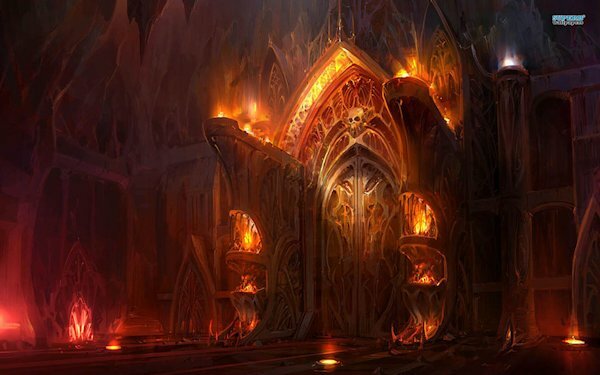 The exterior of Hell was appalling and frightful; it was an immense, heavy-looking building, and the granite of which it was formed, although black, was of metallic brightness; and the dark and ponderous doors were secured with such terrible bolts that no one could behold them without trembling. Deep groans and cries of despair might be plainly distinguished even while the doors were tightly closed; but, O, who can describe the dreadful yells and shrieks which burst upon the ear when the bolts depict the melancholy appearance of the inhabitants of this wretched place! The form under which the Heavenly Jerusalem is generally represented in my visions is that of a beautiful and well-regulated city, and the different degrees of glory to which the elect are raised are demonstrated by the magnificence of their palaces, or the wonderful fruit and flowers with which the gardens are embellished. Hell is shown to me under the same form, but all within it is, on the contrary, close, confused, and crowded; every object tends to fill the mind with the sensations of pain and grief; the marks of the wrath and vengeance of God are visible everywhere; despair, like a vulture, gnaws every heart, and discord and misery reign around. In the Heavenly Jerusalem all is peace and eternal harmony, the beginning, fulfillment, and end of everything being pure and perfect happiness; the city is filled with splendid buildings, decorated in such a manner as to charm every eye and enrapture every sense; the inhabitants of this delightful abode are overflowing with rapture and exultation, the gardens gay with lovely flowers, and the tree covered with delicious fruits which give eternal life. In the city of Hell nothing is to be seen but dismal dungeons, dark caverns, frightful deserts, fetid swamps filled with every imaginable, or represented by different kinds of dreadful torments. All in this dreary abode tends to fill the mind with horror; not a word of comfort is heard or a consoling idea admitted; the one tremendous thought, that the justice of an all-powerful God inflicts on the damned nothing but what they have fully deserved is the absorbing tremendous conviction which weighs down each heart. Vice appears in its own grim disgusting colours, being stripped of the mask under which it is hidden in this world, and the infernal viper is seen devouring those who have cherished or fostered it here below. In a word, Hell is the temple of anguish and despair, while the kingdom of God is the temple of peace and happiness. This is easy to understand when seen; but it is almost impossible to describe clearly. The tremendous explosion of oaths, curses, cries of despair, and frightful exclamations which, like a clap of thunder, burst forth when the gates of Hell were thrown open by the angels, would be difficult even to imagine; our Lord spoke first to the soul of Judas, and the angels compelled all the demons to acknowledge and adore Jesus. They would have infinitely preferred the most frightful torments to such a humiliation; but all were obliged to submit. Many were chained down in a circle which was placed round other circles. In the center of Hell I saw dark and horrible-looking abyss, and into this Lucifer was cast, after being strongly secured with chains; thick clouds of sulphurous black smoke arose from its fearful depths, and enveloped his frightful form in the dismal folds, this effectually concealing him from every beholder. God Himself decreed this; and I was likewise told, if I remember rightly, that he will be unchained for a time fifty or sixty years before the year of Christ 2000. The dates of many other events were pointed out to me which I do not now remember; but a certain number of demons are to be let loose much earlier than Lucifer, in order to tempt men, and to serve as instruments of the divine vengeance. I should think that some must be loosened even in the present day, and others will be set free in a short time. It would be utterly impossible for me to describe all the things which were shown to me; their number was so great that I could not reduce them sufficiently to order to define and render them intelligible. Besides which my sufferings are very great, and when I speak on the subject of my visions I behold them in my mind’s eye portrayed in such vivid colors, that the sight is almost sufficient to cause a weak mortal like myself to expire. 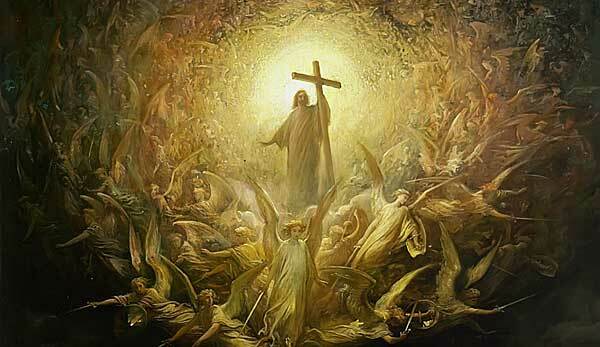 I next say innumerable bands of redeemed souls liberated from Purgatory and from Limbo, who followed our Lord to a delightful spot situated above the celestial Jerusalem, in which place I, a very short time ago, saw the soul of a person who was very dear to me. The soul of the good thief was likewise taken there, and the promise of our Lord, ‘This day thou shalt be with me in Paradise,’ was fulfilled. It is not in my power to explain the exact time that each of these events occurred, nor can I relate one-half of the things which I saw and heard; for some were incomprehensible even to myself, and others would be misunderstood if I attempted to relate them. I have seen our Lord in many different places. Even in the sea he appeared to me to sanctify and deliver everything in creation. Evil spirits fled at his approach, and cast themselves into the dark abyss. I likewise beheld his soul in different parts of the earth, first inside the tomb of Adam, under Golgotha; and when he was there the souls of Adam and Eve came up to him, and he spoke to them for some time. He then visited the tombs of the prophets, who were buried at an immense depth below the surface; but he passed through the soil in the twinkling of an eye. Their souls immediately re-entered their bodies, and he spoke to them, and explained the most wonderful mysteries. Next I saw him, accompanied by a chosen band of prophets, among whom I particularly remarked David, visit those parts of the earth which had been sanctified by his miracles and by his sufferings. He pointed out to them, with the greatest love and goodness, the different symbols in the old law expressive of the future; and he showed them how he himself had fulfilled every prophecy." For complete text see The Dolorous Passion of Our Lord Jesus Christ.